Whatever Happened to the Segway? Published June 5th, 2006	in Misc. Remember “Ginger”? aka Segway? The invention that would give all other inventions an inferiority complex? The invention that would have whole cities ripping out their roads and redesigning themselves around it? Yeah, that one. Whatever happened to all the hype? Since it’s unveiling in 2002, I’ve only seen two being used in real life. And in both instances, the owners were not using it for its utilitarian purpose but to show off a $5000 glorified scooter. Now there are some rumblings of an IPO being on the horizon. I guess the early VC investors want out since it is obvious that the project will not generate any cashflow. Might as well offload the thing to the gullible public, right? The problem, as I see it, is not really with the management of the company or the marketing of the product. Evenso, you have to wonder just how clueless they are when they have only recently made plans to offer leases as a way to mollify the sticker shock. The real problem is that it is ergonomically wrong for a device to make you stand erect, while moving you horizontally. The human body wasn’t designed for that. In fact, we need to be in constant motion. It doesn’t help either that the Segway offers no real shock absorbers; causing any bump or vibration to travel right up your spine. 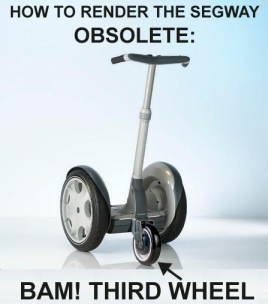 In the end, the Segway will be a footnote in history. Look for it right beside the citation for the Apple Newton.